The streets of Twitter can be a dangerous place for politicians to hang out — but it’s increasingly seen as a vital channel for reaching young people in particular. On Monday night, President Cyril Ramaphosa took the plunge, fielding questions sent his way. Some questions, that is. Indeed, the list of questions not answered by Ramaphosa was in some ways more interesting than those he chose to tackle. 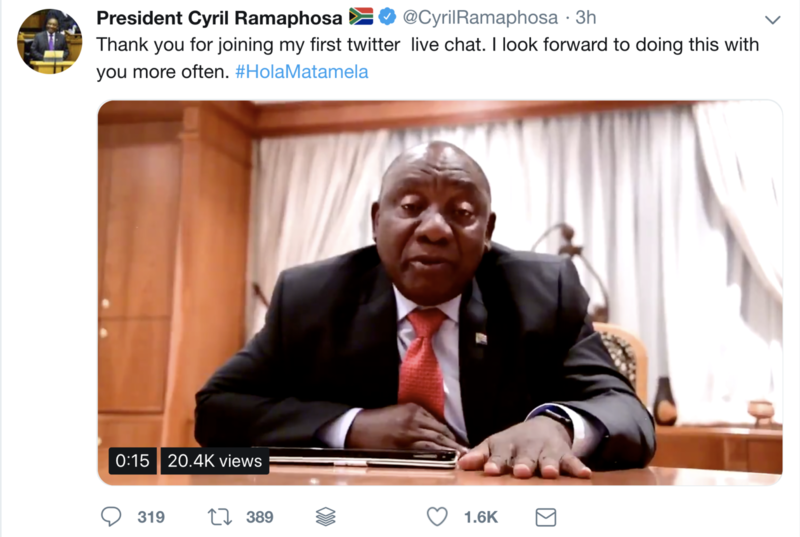 When President Cyril Ramaphosa took election campaigning to the digital sphere on Monday night, his advisers had clearly hoped that a level of chummy informality would prevail — judging, at least, from the chosen hashtag: #HolaMatamela. But Ramaphosa was not about to suddenly let his hair down and reveal himself to be fluent in Internet-ese. Every one of the 22 answers Ramaphosa provided to his Twitter audience read as though they could have been clipped from a presidential speech to Parliament. “Some of the questions have really been able to get my mind racing and thinking about what needs to be done,” the president said in a short video clip posted to mark the end of the Q&A. Perhaps Ramaphosa was referring to the mentally invigorating effects of the questions he chose not to answer — because the president stuck largely to safe ground in his Twitter engagement. Among the questions Ramaphosa neglected to respond to were strongly worded interrogations about his role in the Marikana massacre, his ambivalent attitude towards traditional leaders, the source of his personal wealth, the nature of his relationship with Bosasa boss Gavin Watson, and his intentions for high-ranking ANC figures implicated in corruption. But it would be unfair to say that the president dodged all sticky questions. One of the most popular topics raised by Ramaphosa’s audience was that of the ongoing unrest in Alexandra, with the president having been accused of opportunism after putting the blame for the majority of the township’s ills on Johannesburg’s DA Mayor Herman Mashaba. Ramaphosa was also reported to have told Alex residents that one million houses would be built for them over the next five years, a promise which was the subject of much Twitter scepticism given the time frame involved. The president used his Twitter platform to clarify that “the million houses issue in Alex is a huge distortion”, explaining that the figure of one million referred to the national housing target over five years rather than the allocation for Alex in particular. The topic of recent xenophobic violence was also top of mind for many. While Ramaphosa stressed that “these attacks on foreigners are a matter of great concern”, he also made sure to toe the government line in insisting that “these attacks shouldn’t always be seen as xenophobic”. A reluctance to view violence against foreigners as xenophobic, or even to use the word “xenophobic”, has become standard government practice over the past decade. Ramaphosa defended this position on Twitter by citing the case of a KwaZulu-Natal “dispute between a Malawian and South African which led to two South Africans losing their lives”. He did not mention that the origins of the violence in question reportedly saw South Africans storming foreign-owned spaza shops. Land also came up — although amid a flurry of hostile accusations aimed at him by apparent EFF supporters, Ramaphosa chose to respond to a relatively softball query about why the presidential panel he appointed in September 2018 to look into the land question was expected to complete its work within only six months. The president responded that although an “interim report” was due shortly, the panel “may well ask for an extension as there is still a lot of work to be done”. With regard to the particularly contentious status of the Ingonyama Trust as KwaZulu-Natal land custodians, Ramaphosa said only that “discussions” were continuing. Responding to another interlocutor, Ramaphosa said that resolutions taken by the ANC — of which land expropriation without compensation was the major outcome of the 2017 Nasrec conference — had to be implemented “with greater urgency”. Asked about governmental bloat, the president confirmed that the long-awaited reduction in the number of ministries is still en route. “We are in the process of finalising our thoughts on the reconfiguring of the state to where we will have reduced ministries, that will work more effectively,” Ramaphosa said. He did not give any indication of when this downsizing could be expected to take place. The president made no direct mention of ANC Secretary-General Ace Magashule or other controversial colleagues. But a response Ramaphosa gave to one question was a possible veiled rebuke of Magashule’s instruction to Western Cape voters not to “waste your vote on the white man”. One of Ramaphosa’s most straightforward answers came in response to a call to reconsider the implementation of the death penalty. “The state should not be the one to terminate a life”. It was a refreshingly unambiguous response to a populist issue with which South African politicians have traditionally tended to toy come election time. At the end of his Twitter session, Ramaphosa said in his farewell video clip that he had enjoyed the engagement so much that he intended to make it a weekly, or even twice-weekly, commitment in future. Watch Pauli van Wyk’s Cat Play The Piano Here! No, not really. But now that we have your attention, we wanted to tell you a little bit about what happened at SARS. Tom Moyane and his cronies bequeathed South Africa with a R48-billion tax shortfall, as of February 2018. It's the only thing that grew under Moyane's tenure... the year before, the hole had been R30.7-billion. And to fund those shortfalls, you know who has to cough up? You - the South African taxpayer. It was the sterling work of a team of investigative journalists, Scorpio’s Pauli van Wyk and Marianne Thamm along with our great friends at amaBhungane, that caused the SARS capturers to be finally flushed out of the system. Moyane, Makwakwa… the lot of them... gone. But our job is not yet done. We need more readers to become Maverick Insiders, the friends who will help ensure that many more investigations will come. Contributions go directly towards growing our editorial team and ensuring that Daily Maverick and Scorpio have a sustainable future. We can’t rely on advertising and don't want to restrict access to only those who can afford a paywall subscription. Membership is about more than just contributing financially – it is about how we Defend Truth, together. So, if you feel so inclined, and would like a way to support the cause, please join our community of Maverick Insiders.... you could view it as the opposite of a sin tax. And if you are already Maverick Insider, tell your mother, call a friend, whisper to your loved one, shout at your boss, write to a stranger, announce it on your social network. The battle for the future of South Africa is on, and you can be part of it. Please note you must be a Maverick Insider to comment. Sign up here or sign in if you are already an Insider. Adidas will cancel any player's sponsorship deal if it turns out they have anything to do with Scientology. There are many great benefits to being a Maverick Insider. Removing advertising from your browsing experience is one of them - we don't just block ads, we redesign our pages to look smarter and load faster. Click here to see other benefits and to sign-up to our reader community supporting quality, independent journalism.